Geek Girls Rule! #137 – Review: Sepiachord Passport – Geek Girls Rule!!! 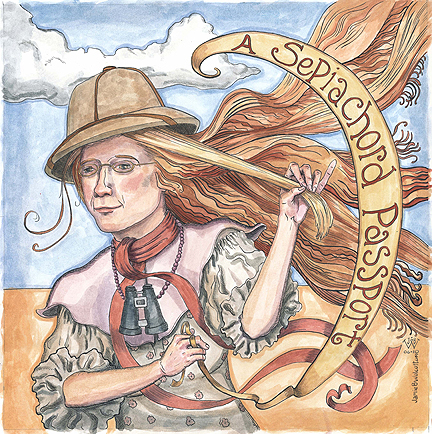 You can buy the Sepiachord Passport on the site (or you will be able to soon), or if you happen to meet Mr. Bodewell while out and about. It is with much gratitude that I read your kind assessment of my composition “The Dance Master”. Although I am known most notably as a musical jester, spotlighting social issues is something near and dear to my heart. My first full-length recording, “Cabaret4Choice” released in 2003 dealt with the intricacies of reproductive freedom. Unfortunately, because I chose to deal in shades of gray, rather than in “Us vs Them”, I found little support for that project because it did not toe the party line of any existing organizations dealing with “Choice”. So, from that I cam away with the knowledge that it is to our own internal vision that we owe allegiance. If others can find merit, that is to their credit. But when all is said and done, we must answer to our Selves. If I may be so bold, here is a prime example of one of my comedic numbers, entitled “Internet Date” which is getting a lot of hits on YouTube. It’s a geekly labor of love- the cartooning and art direction are by Kyle A. Carrozza, a storyboardist for Nickelodeon. He and animator John Berry also collab on a comic entitled Frog Raccoon Strawberry. A musician aka as TV’s Kyle, I found him online via TheMadMusicArchive.com, and it took me two years of cyber-stalking him before he finally agreed to lend his visual talents to my song. I will definitely embed that in a post, if I may? I’m also very eager to track down your other CD and give it a listen. Vous most certainly embed anything related to my music into any post your heart desires, and merci encore for the kind consideration!